Rev: PACE P R TERRA MARIQ PARTA IANVM CLVSIT Temple of Janus towards right, doors closed; S - C to right and left. Obv: NERO CLAVD CAESAR AVG GERM P M TR P IMP P P Laureate head left. Rev: VICTORIAE AVGVSTI S - C ; II in ex. Victory walking left holding wreath and palm. 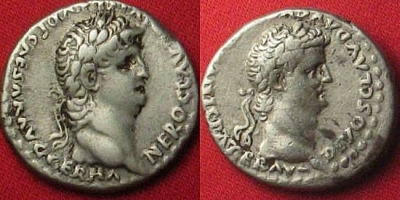 Obv: NERO CLAVD CAESAR AVG GER P M TR P IMP P P Radiate head right. Rev: ROMA S - C Roma seated left on cuirass, holding wreath and resting arm on parazonium. Obv: NERO CEASAR AVG GERM IMP Laureate head right. Rev: PACE P R VBIQ PARTA IANUM CLVSIT S - C Temple of Janus, "right" view, with doors closed. 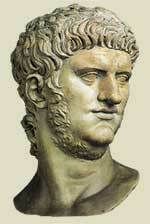 Obv: NERO CAESAR AVG GERM IMP Laureate head right. Rev: S - C Victory alighting left holding shield inscribed: SPQR. Obv: NERO CAESAR AVG GERM IMP Laureate head left. Rev: S C Victory standing left holding shield inscribed SPQR. Obv: IMP NERO CAESAR AVG GERM Laureate head right. Rev: S - C Victory flying left holding shield inscribed: SPQR. Rev: IMP NERO CAESAR AVG P MAX TR P P P Laureate head right with small globe at truncation of bust. Obv: GENIO AVGVSTI S - C Genius of the emperor standing left sacrificing from patera over altar and holding cornucopia. 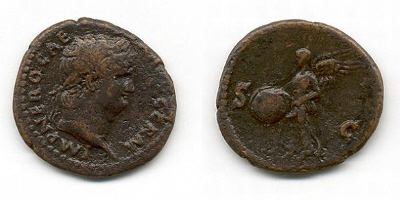 Obv: IMP NERO CAESAR AVG P MAX TR P P P Bare head right wth small globe at truncation of bust. 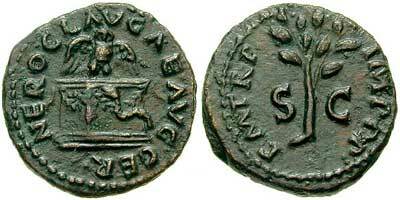 Obv: NERO CLAV CAE AVG GER Owl with wings spread, standing facing,on garlanded altar. Obv: NERO CLAV CAE AVG GER Column surmounted by helmet, shield propped on right, transverse spear behind. 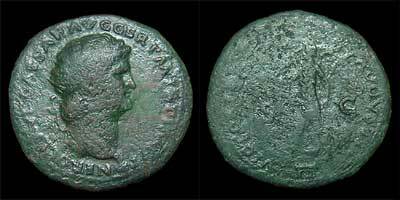 Obv: NERO CLAVD DIVI CLAVD F CAESAR AVG GERM Laureate head of Nero right. Laureate head of Claudius right..
Obv: N gamma gamma ISPAE SISPASTOR Bare-headed draped bust of Nero right, tooled lituus in field right. Rev: Heavily tooled "Annona" reverse with many fantasy additions.